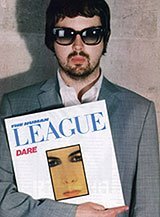 So the guy on the left, holding his copy of Dare and looking pissed, is the pop-guru Richard X. The producer/DJ made his rise to fame with the bootleg Girls on Top EP, probably the main reason why we still can't seem to be free of the scurge that is bootlegs. Actually that EP more or less started the avalange that stills seems to bury mainstream music today. After that, admittetly brilliant EP, Richard was set to become one of the new hip and happening underground producers that you would go to if you needed to get some of that, hard to get, pop-credibility - something the pop world always seems to crave. He has done some production on last years M.I.A. album Arular, Rachel Stevens' grossly neglegted album Come And Get It and of course on the album of Norwegian pop-princess Annie. Richard X productions are hard to describe - maybe the most precise word is delicate? At least his songs and remixes seem to have a sterile quality to them, nothing bad of course and they always seem to start of rather slowly, but in the end you're always dancing!